Here is the topic about, how to deactivate flash message on Nokia Lumia phones. A flash message is a message that's come to the phone and flash on the screen in full scree mode with having a OK button, if you touch/select the OK button you will charge the price mention on that message. So if you are receiving this type of messages, it can be disable/deactivate by using the following steps. The settings for flash message is almost same on all Nokia Lumia series phones. 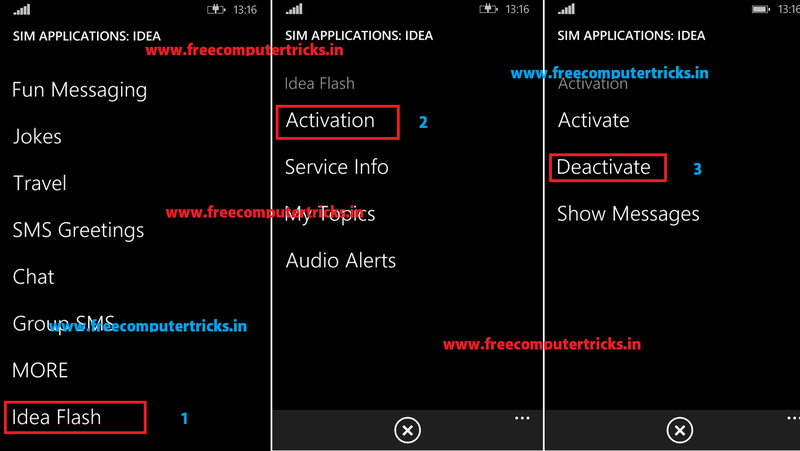 Here is the process to deactivate flash message on Nokia Lumia 520 using Idea SIM Card. 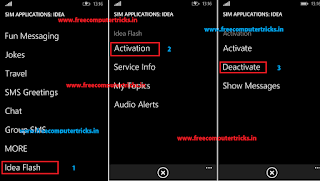 Check the above image to deactivate flash message on Nokia Lumia 520 for idea SIM users. If you are using any other SIM cards the process is same upto SIM Application then check one by one to deactivate the flash messages. That's all now you will not receive the flash message on the device.